iNovah will consolidate all revenue and cashiering functions of the Office of the Clerk of the Circuit Court for all areas of law by providing a single system for managing the revenue life cycle from payment collection through reconciliation, audit and reporting activities. A client since 2003, the Office of the Clerk of the Circuit Court of Cook County joins the Cook County Sheriff’s Office and Department of Revenue in using the latest version of iNovah ERM. iNovah’s ability to centralize revenue management and bring revenue into focus is the reason 5 of the 20 largest counties and 14 of the 30 largest cities in the nation have selected iNovah as their ERM hub. “This is a very significant modernization project for the Clerk of the Circuit Court that will provide benefits today and into the future for both our citizens and staff,” said Dorothy Brown, Clerk of the Circuit Court of Cook County, Illinois. “Citizens will now have the added convenience of using credit cards to make payments. Additionally, staff will now have greater capabilities to manage, control, report and audit payment collections from anywhere in real-time. System Innovators is the leading provider of centralized cashiering and enterprise revenue management for government in the nation. 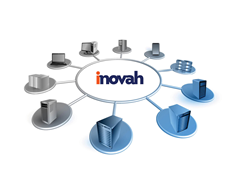 iNovah replaces the cashiering and/or collection component of source systems with an interface that permits iNovah to become the hub for all revenue collection. iNovah seamlessly connects to any payment channel (web, phone, kiosk, etc.) and provides automatic revenue distribution to general ledger accounts with any financial system. System Innovators offers over 35 years of expertise integrating with hundreds of source systems and providing clients with industry best practices on every project. System Innovators is a division of N. Harris Computer Corporation and a leading provider of financial management and client information system software solutions. Enterprise revenue management offerings include fully configurable PCI compliant payment collection, cashiering and financial reporting solutions. Specializing in citizen self-service, revenue management, auditing and financial reporting, System Innovators’ products integrate seamlessly with websites, banking institutions, payment card gateway providers, as well as host and financial systems.